Golden Tegu is also called Colombian Tegu. They are usually light bodied (males being bigger than females). They are agile and very powerful. They have many black and gold stripes down their body. They typically do not make as good a pet as its larger southern cousins; Black and White Tegu or the Red Tegu but if handled frequently, can make a good pet. For a lizard that can reach 1 meter (3.5 feet) I would not recommend a smaller enclosure than a 1.8 x 0.9 meters(6 x 3 feet). With the water bowl and basking area there really isn’t as much space as you think there would be. A preferred size is 2.4 x 0.9 or 2.4 x 1.2 meters (8 x 3 or 8 x 4 feet). Baby’s can be started off in 1.2 x 0.6 meters (4 x 2 feet) but it won’t last them longer than a year. Given the chance tegu’s will climb but a arboreal enclosure is not a must. With a minimum of 0.2 meters (0.6 feet) of substrate you’ll need at least a 0.6 meters (2 feet) tall enclosure (preferably higher). I would suggest building your enclosure around a frame and out of exterior wood. I use OSB3, it’s cheap, strong, durable, doesn’t look nice but once you seal and paint it it’ll look just as nice as other wood enclosure. For sealant I would use G4 pond sealant 2 coats should work. It is completely waterproof when set. Tegus burrow to create their own hides, if given the opportunity. Other options are: built in shelves, humid boxes, or even plastic totes with holes cut into them and turned upside down. In the wild Tupinambis teguixin live in burrows, therefore you should provide a deep, moist, burrowing substrate. My favorite is a sand soil mix at about a 40% sand-60% soil on half the enclosure then orchid bark on the other half. For adult you would need at least 0.2-0.3 meters (0.6-1 feet) to allow them to dig around. I find this substrate also holds humidity very well. Some keepers have a preference like cypress mulch, this also works well. Tupinambis teguixin come from a much hotter climate than their argentine cousins, so unlike the argentines they do not hibernate over the winter. They may go into a mild brumation. For babies I would suggest a temperature of around 43ºC (110 ºF) for basking temperatures, this should get the hot side to around ºC (95 ºF). They should always have somewhere to cool down, so the cool side of the enclosure should be from 24-27 ºC (75-80 ºF). The only thing I would change for adults is the basking temperature, I have mine at around 55 ºC (130 ºF), anything from 29-57 ºC (120-135 ºF) is perfectly fine. To reach these temperatures I use par38’s a row of 2 50W’s from a height of around 12” would heat it nicely. For a smaller enclosure 1 80W will do the trick. UVB is believed to be essential for Tegu of all kind! It prevents metabolic bone disease and helps bone growth. The D3 produced by the UVB lights help metabolise calcium which is crucial for correct growth. The choice of what UVB light you use is entirely up to you, unless it’s a low% or coil. I highly recommend the Arcadia T5 6% on a reflector. They only need changing once a year, they are much more powerful than the T8’s too. Some keepers prefer to use and Mercury vapour bulbs like powersun, bright sun (believed to be the best M.V. and solar glo). MostMercury vapour bulbs need changing once a year unless they pop. For when it’s nice and sunny outside I recommend building a mesh outdoor enclosure to use for a certain period of time during the day (only 1 or 2 hours) so that they can get natural UV. This is very nourishing for them and it’s one of the best things you can do for them. Tupinambis teguixin love water, golds are thought to be semi-aquatic. A deep and large water bowl is a must in my opinion. The water should be changed daily (as Tupinambis teguixin like to do their ‘business’ in the water) and should be deep enough to allow them to submerge their entire body. Bathing them is also a great idea as it allows them to swim around. It also helps with humidity and shedding. Under the basking light humidity wont be very high (around 20-30%) but in the cool end it needs to be around 60-80%, you can achieve this by using the correct substrate and correct depth. Spraying/misting the enclosure once or twice a day will help too. Golden Tegus are carnivorous, though a little bit of fruit won’t harm as a treat unless it’s highly acidic. I like to use a huge variety of foods, this includes: fish, minced turkey, lean diced beef, quail egg (raw), hard-boiled egg, mice, chicks, rats, locust, dubia roaches, morio worms, young giant African land snails (CB). Foods such as: earthworms (nightcrawlers), quail, other species of roaches such as red runners are all ok to feed. Young Tupinambis teguixin may accept crickets. All inverts should be dusted with calcium (no D3, using D3 calcium too much can lead to a D3 overdose which can be fatal!) and gut loaded before feeding. A tegu should be made to work for their food, worms tend to burrow down so that means the tegu goes digging after them, this prevents them from getting bored. They also need the exercise and chasing their food helps. A comprehensive food list can be found here. Gold/Columbian tegu’s are know to be aggressive but I think that’s mainly down to the owners techniques. Most will not be as ‘tame’ as argentines but they will tolerate handling. You first have to build trust and not rush things, tegu’s are highly intelligent and take time and patients to tame down. Be prepared for maybe a couple of bites and a fair few tail whips. A young tegu shouldn’t hurt so much, but believe me, a bite from an adult will! 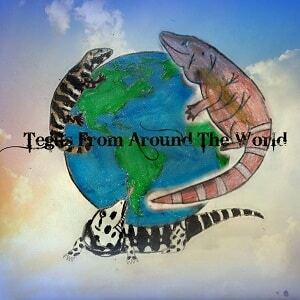 Tips on how to properly handle your tegu can be found here. Cleaning schedules can vary depending on the type of set up you have your tegu in. Some keepers who have opted for a bioactive style enclosure have been able to go years without having to do do any major clean ups. Others prefer to do a monthly clean up to help maintain a clean environment, I always do a spot cleaning to keep the enclosure clean. Tegus don’t shed like snakes (all in one piece). Oftentimes, one part of their body will start shedding before another. Make sure they are well hydrated and, if needed, provide them an extra bath in order to assist the shedding process. It is common for reds to require extra help. Keeping up with a proper diet will assist with the shedding if its a healthy shed, but if it’s a continual problem you may need to adjust your humidity or diet. Everything is interlinked so if one isn’t right they all suffer. 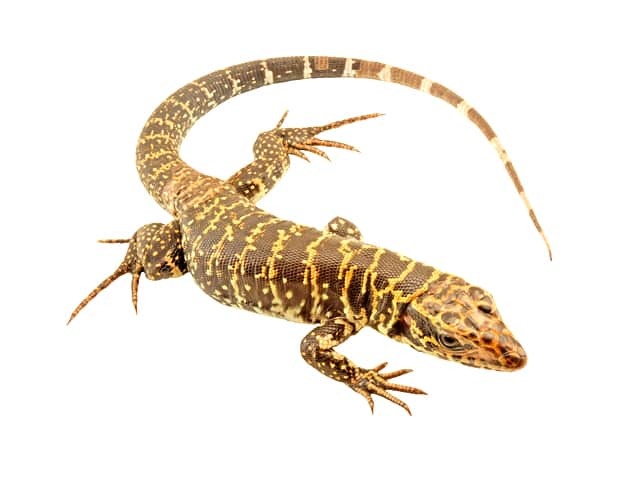 Tegus can suffer from most forms of common lizard ailments/ problems like impaction. gout, dehydration, scale rot and respiratory infections. The biggest one to lookout for is the calcium deficiency, otherwise known as MBD (metabolic bone disease), vitamin D overdose , tail lose(regenerated tails), inadequate heat and humidity. Remember that every care sheet is a basic guide. It cant solve all problems that each individual household may face, Always have a exotic vet on hand.